Having been an iPhone user for nearly two years now, I’ve heard pretty much every gripe there is to hear about the iPhone’s onscreen keyboard—I've even agreed with a few of them. But it’s not as if there’s much in the way of alternatives. However, if you’ve jailbroken your phone, you might consider taking a gander at the new keyboard app iTypeFastR. The iPhone’s built-in keyboard does do a lot of this kind of optimization under the hood, dynamically readjusting how large the areas for letters are depending on what it predicts you’re trying to type. 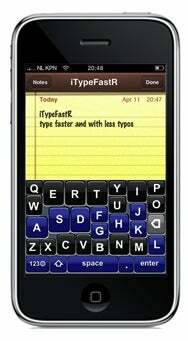 But if you’re frustrated with the iPhone’s current keyboard, have a jailbroken phone, and don’t mind spending $4, you can give iTypeFastR a shot.